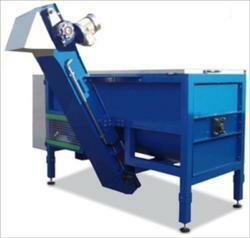 Leading Manufacturer of decomposting machine from Pune. The composting machines consist of shredder & mixer for simultaneously mixing & shredding of waste for uniform size. The machine also mixes the composting culture & dry material such as dry leaves, saw dust etc. with the shredded waste for absorption of excess moisture. The output of the machine is raw compost which can be further cured to form compost. All the machine wetted parts are in SS 304. Geared motors are with energy efficient in line Helical Gearbox. Control panel with Automatic Microelectronic components with preset batch time. Machine with built in safety for stopping machine in case of lid open. Easy control panel access from rear side of machine.